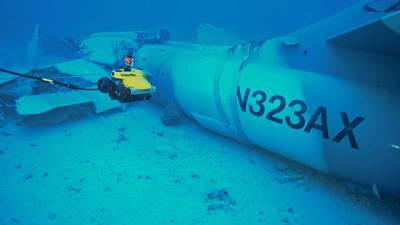 A remotely operated underwater vehicle (ROV) was recently used to help locate a downed fighter jet off Hawaii. The privately owned Hawker Hunter aircraft crashed on December 12, 2018 while participating in the Hawaii Air National Guard sponsored training exercise Sentry Aloha. The pilot ejected before the crash and was rescued by the Coast Guard with the assistance of nearby good Samaritans, but the plane was sent crashing into the ocean. The aicraft hit the water about 1 mile south of Honolulu in an area with many small boats. The number of boats in the area meant there were many cellphone videos, making the general location of the plane easier to pinpoint. Working to find the sunken aircraft, Parker Marine Salvage contacted Steve Van Meter of Van Meter Consulting to help pinpoint the exact location. An extensive sidescan sonar mission, lasting several days, had identified 75 potential targets on a seabed littered with old debris from years of dumping. Van Meter studied these targets and identified the one that had a very high probability of marking the aircraft. Once on the water, the team made quick work of locating the downed aircraft despite 4- to 6-foot swells and winds of 10-15 miles per hour at the surface. Due to these conditions the boat could not be anchored, and the crew was required to live-boat, while Van Meter navigated his ROV underwater. Still, the entire in-water mission to locate and identify the wreckage took 30 minutes after setting up. Using his VideoRay Pro 4 ROV, Van Meter located the fighter jet in about 245 feet of water on December 30, 2018. "The plan for the mission was five to seven days," Van Meter said. "The VideoRay made it possible to mobilize quickly and fly to Honolulu with everything I needed. We could setup rapidly on the boat, and use power supplied by a small Honda generator. Due to size and weight of the Pro 4, I was able to use a deck hand as a tether manager after a few minutes of training." 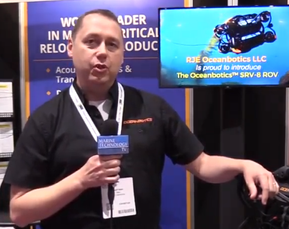 After analyzing the data from the ROV, the salvor consulted with an engineer, formulated a plan, and received concurrence from the U.S. Coast Guard to proceed. Using the ROV, the salvage company lassoed the tail of the aircraft wreckage with line and slowly raised it to the surface. The team towed the section to a haul-out point designated by the State’s Department of Land and Natural Resources Division of Boating and Ocean Recreation Division. Following the section’s removal from the water, it was transported by truck to Marine Corps Base Hawaii, where the NTSB will continue its investigation into the cause of the crash.